Police and arty people around the world are hunting for paintings worth over £80 million looted from the Paris Museum of Modern Art last thursday. Like a Holywood movie script, the guards saw zilch. Only the ghostly, flickering image of one masked raider was caught briefly on the art gallery's security cameras. 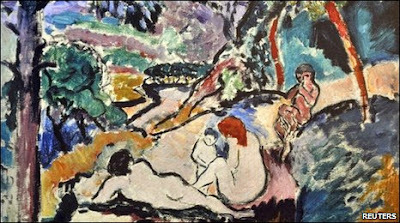 The five stolen paintings are Pastoral by Matisse, Pigeon with Green Peas by Picasso, Still Life with Candlestick by Leger, Olive Tree near l'Estaque by Braque and Woman with Fan by Modigliani. It must surely be an insurance scam or that illusive hoarding art collector again - because they have no chance of selling works like these. A theory goes that international drug dealers use high value works of art as a type of currency. If so, they must be sniffing their own stock too much. Any irish art collectors who are approached in a pub by a shady looking character with a large flat parcel wrapped in brown paper can be fairly sure that it is not an Irish artist fallen on hard times - although God knows there are enough of them about. Contact INTERPOL's Stolen Works of Art online database right away.